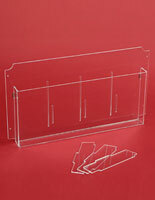 or (2) 8.5" x 11" or (4) 4" x 9"
or (2) 4" x 9"
What is the advantage of purchasing cable display components over traditional sign systems? 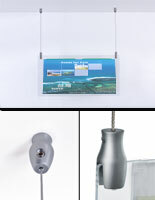 These hanging advertising displays offer a sleek, modern, affordable way to customize signage in retail showrooms and galleries. 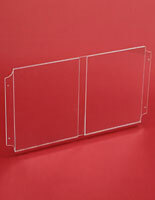 In addition to hardware and wiring, this selection of cable display components includes acrylic laser-cut pockets with smooth edges and holes for wire ensure a variety of literature can be dispensed. 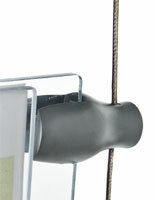 Hang an array of brochure and sign holders using these cables for impactful, layered messaging. 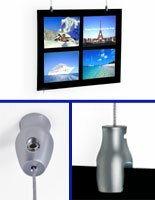 Purchase accessories for floor to ceiling mounting system in kit form with hardware included, or individually. Easy to follow print and video instructions are included. 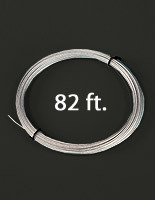 Each of these cable display components, also known as suspended signage, is designed for creating cool art spaces or promotional messaging. 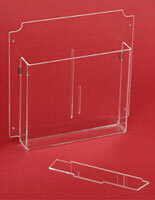 Cable display components include acrylic pockets, cording, and mounting hardware such as clamps, cables, set screws, anchors and allen keys. 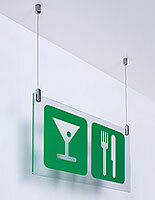 What are the benefits of using a suspended wire system over traditional sign supplies? 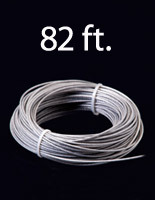 Flexibility: Cable display components provide everything needed for arranging signage throughout a store or museum, giving users numerous options for customization. Most of these systems can be hung from the ceiling, freeing up counter, floor, and wall space. Convenience: Signage top-loads into each enclosure, so new advertisements, sales, and specials are updated quickly & easily. Affordability: Who doesn’t like to save money? 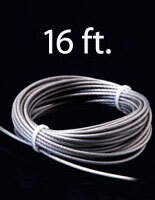 Compared with other ceiling suspension systems, these won’t break the bank -- buy just what you need. 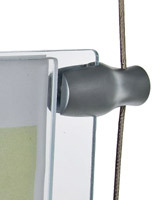 Aesthetics: Modern, clean lines make a subtle statement when using these hanging displays, keeping the emphasis remains on advertising graphics or artwork. Configuration: Mixing and matching supplies from this line is easy when everything is available in one place. 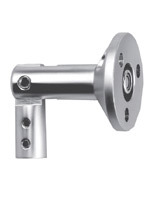 Buy suspended systems with hardware, mounts, and cable components included, or purchase parts separately. Buy only what you need! 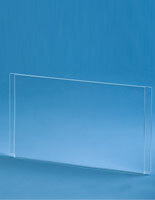 Cable display connectors and acrylic panels can be customized to an organization's specific needs. 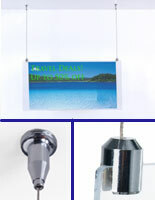 Inspire interest using these eye-catching promotional systems. 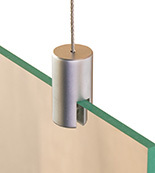 Storefront managers will love how hanging cable connectors and accessories free up floor and wall space for foot traffic and other exhibitions. 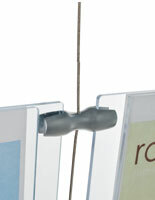 Hanging poster hangers are the perfect choice for galleries, museums, retail showrooms, travel agencies, airports, and professional offices; they also make excellent for wayfinding and directional signage; and homeowners with high or cathedral ceilings love using this suspended signage for artwork. 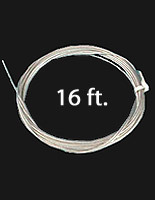 Purchase stainless steel wire connector systems in various lengths, from 16' to 82', with a nylon coating to prevent fraying ends and scratched hands, to support ceiling-to-floor and window signage. 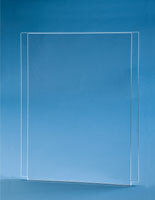 Buy in bulk for big discounts when outfitting a large showroom or public exhibition space. 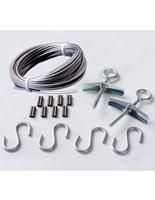 Unlike other sign supplies sold in pre-determined lengths, the cables sold here can be cut to any length (cable cutters and crimping tools are not included.) 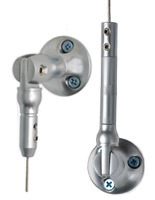 Kits come with a floor and ceiling mount, steel wire, screws, clamps, cable, S hooks, turnbuckles, or toggle bolts depending on the system. 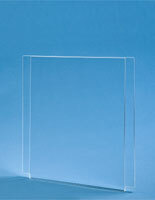 Purchase mounting kits in different sizes and designs; an angled design displays pictures and advertisements with acrylic panels. 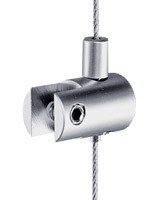 Edge grip clamps are installed using an allen key and set screws (nylon tips prevent scratching). 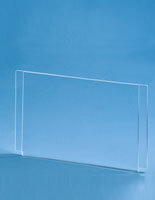 Mounts with lateral panel support in a side-by-side configuration are great for large signs and light boxes. 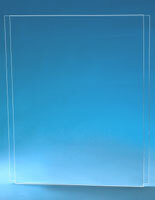 Choose side-by-side signage options for double the impact for thee same price!